A legislative ethics panel fined Lopez $330,000 and released a 68-page report describing how the Assemblyman groped and propositioned eight of his female employees. 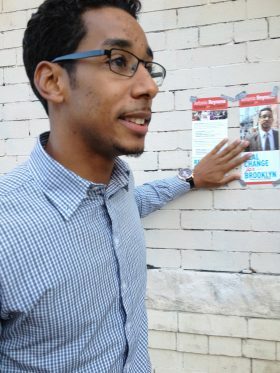 Despite these findings (and the occasional no-show at a senior center), the New York Times reported that Lopez has “a fair chance of winning” the race due to his longstanding ties to the neighborhood. But Antonio Reynoso also has deep roots here. He’s the chief of staff for the current council member, Diana Reyna. His own campaign office is on South 3rd Street, two blocks from where he lives with his sister and her eight-year-old son. His mom still lives around the corner in the apartment where he grew up. Reynoso is thin, with a shadow of facial hair. He looks like an enthusiastic young high school teacher. At a bagel shop on Grand Street last Thursday he explained that when it comes to elections, typically “it’s about housing, housing, housing. But you need better schools, libraries, and transportation options.” He wants to implement participatory budgeting, work with teachers and parents to triage local schools, and make Bushwick — “where bike lanes go to die” — safer for cyclists. Reynoso prefers to bike around Brooklyn and has posed for campaign pictures in a helmet. Reynoso has gained endorsements from several high-profile local democrats including Brooklyn Borough President Marty Markowitz and mayoral hopefuls Bill de Blasio and Christine Quinn, who started the Women 4 Antonio campaign to “ensure that Vito Lopez never sets foot in City Hall.” If Lopez won, Reynoso thinks he’d be a “pariah in City Council” — a liability this embattled district can’t afford. Because of rising rents and unemployment, the Latino population here has decreased by 10,000 over the past 10 years. Many believe the actions of pro-development advocates like Lopez helped to make this displacement possible in District 34. In his quest to keep government goodwill and resources in the neighborhood, Reynoso left the bagel shop and caught a ride from his campaign manager to talk with voters in Ridgewood. There weren’t many left to visit. He’s already knocked on the doors of least 2,500 Democratic voters. The woman seemed tired. “Yes. You can,” she nodded. But this was a “soft” yes. 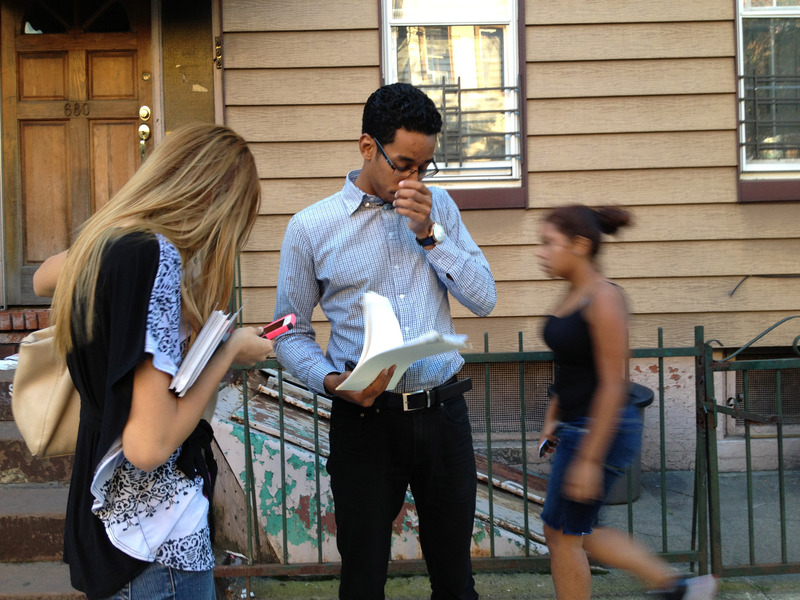 Reynoso wanted to talk issues and it’s hard to shout your plan to improve public schools from the stoop. A middle-aged woman gave him a warm hug a few blocks away. She’d worked at his junior high. Speaking Spanish, she remembered when he danced the tango in front of the whole school. She told him he was getting too skinny. “Cuídate,” she waived as he turned the corner. After about an hour, Reynoso met up with Diana Reyna, his boss and the current council member in District 34, and Melinda Katz, a former council member running for Queens Borough President.